1. March 2017. 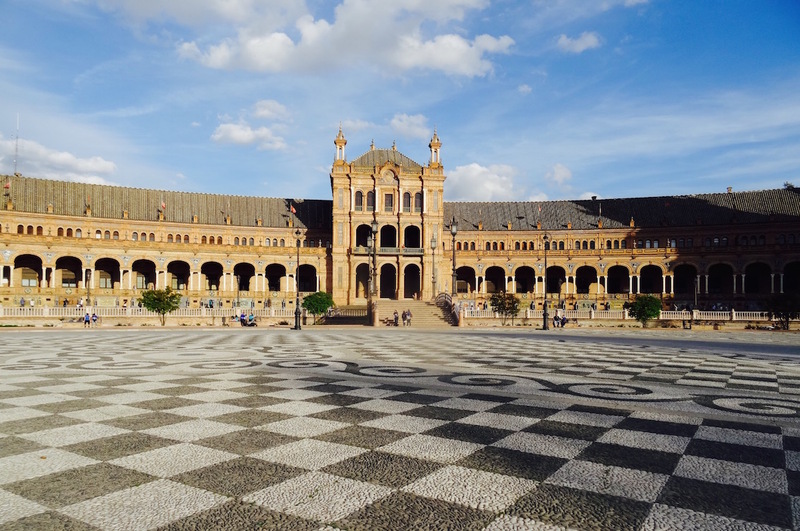 I’ve been living and traveling around the world for over fifteen years now, but I’ve never seen anything quite like the incredible Plaza de España in Seville. 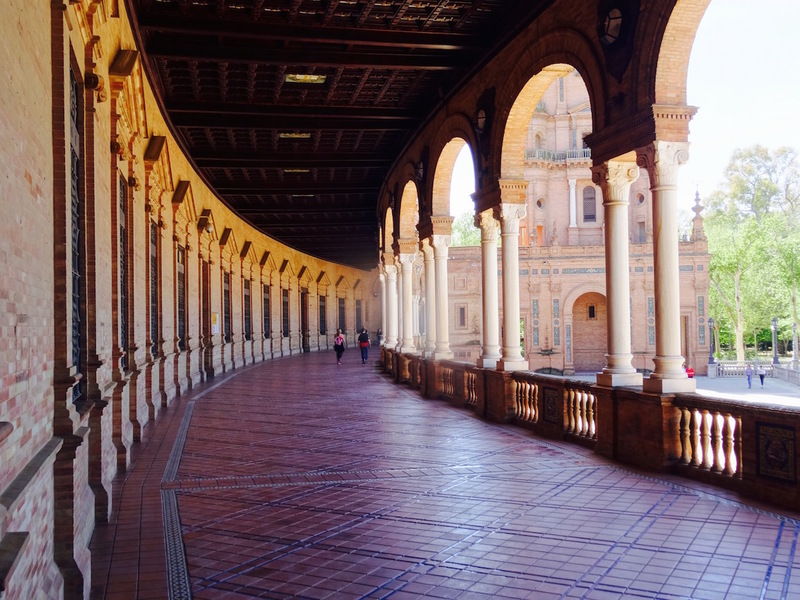 Situated in the city’s gorgeous Maria Luisa Park, this staggering renaissance/neo-Moorish style structure stands in a league of its own in terms of scale and ballsy grandeur. A semi-circular brick structure with a tower at each end, it stands guard over a five hundred meter canal crossed by four bridges. The entire thing was built especially for the Ibero-American Exposition of 1929 to showcase Spain’s industry and technology exhibits. 2. March 2017. Do a bit of online research and you’ll read plenty of articles claiming: “You’ll either love it or hate it!” Wonderboy and I adored it and I feel like you’d have to be a special brand of miserable sod to walk away from this place unimpressed. The square was designed by Aníbal González, who was given free reign to create a ridiculous dreamscape befitting the biggest cultural event Spain had ever seen. Today the square houses various government buildings, including the all-important office where foreigners go to apply for their ID cards. 3. March 2017. The square’s four exquisite bridges represent the ancient kingdoms of Spain. You can rent a little boat to go rowing down the canal! And right enough we saw plenty of couples and mischievous teens drifting about, one group in particular looking totally out of their depth as they bobbed hopelessly from side to side. 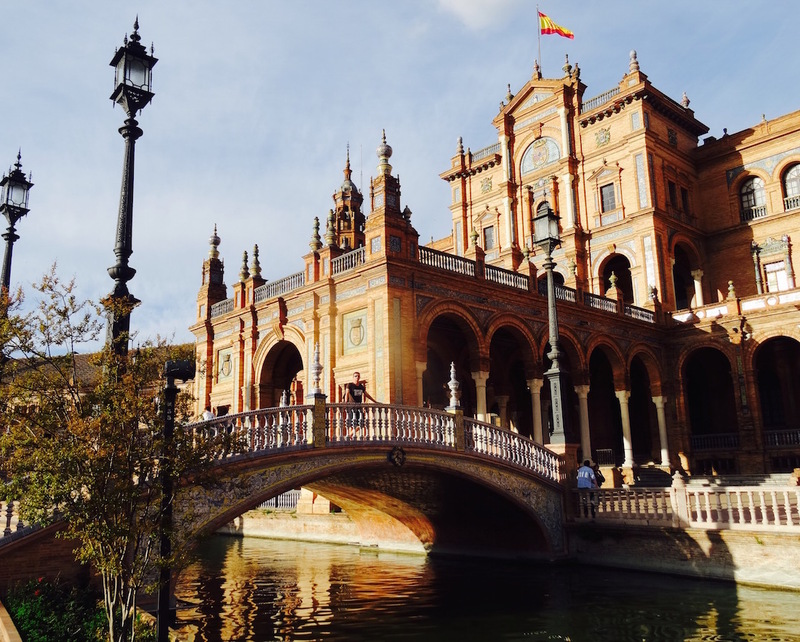 Horse and carriage rides take people around Maria Luisa Park and include a circuit of Plaza de España. 4. March 2017. The plaza’s tiled alcoves provide the best portrait photo opportunities. Cleverly, each alcove represents a province of Spain, which has Spanish guests eagerly seeking out their home alcove. In addition to this overview shot I was also keen to grab a picture of the Malaga alcove, while my mate opted to rest his legs in the random choice of Tarragona. Good, clean fun. 5. March 2017. A walk along the building’s balcony terraces is a must, especially if you’re a big Star Wars fan. It was here that Anakin and Padmé embarked on a walk-and-talk in Attack of the Clones, while exterior shots were also used for the city of Theed on the planet Naboo. The square also pops up in the Sacha Baron Cohen comedy The Dictator, not to mention the video for the Simply Red song Something Got Me Started. 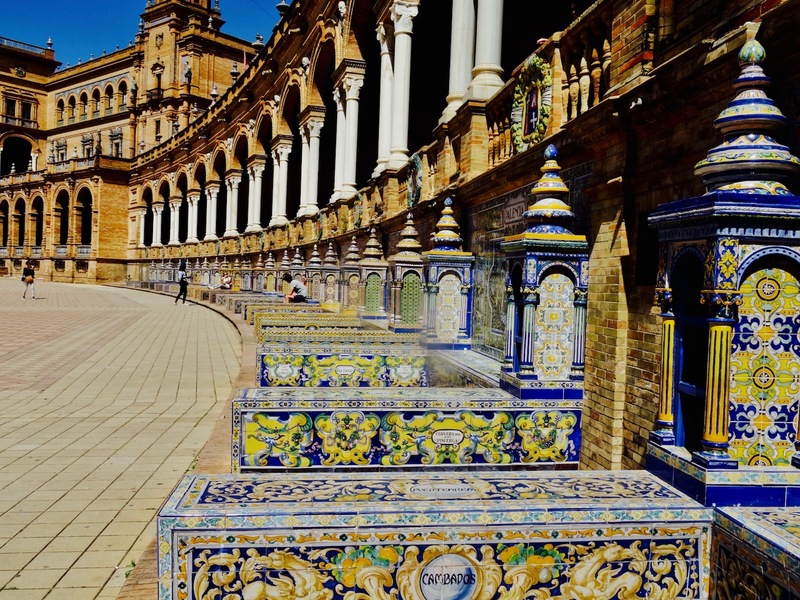 For more on this incredible city have a read through my other articles on Seville. Interested in finding out more about the region? Then check out My 5s from around Andalusia. 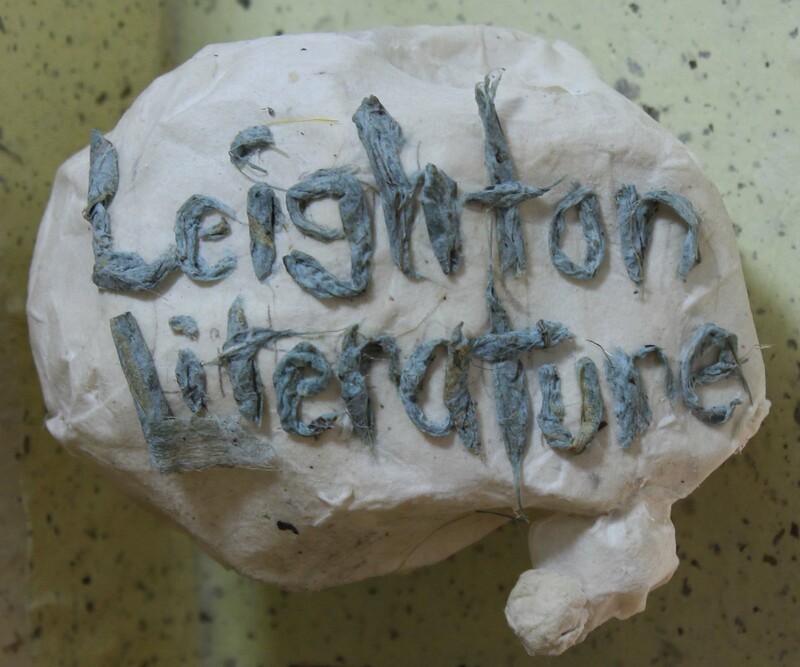 And that’s just the tip of the iceberg! Why not also take a look at my many more articles from across Spain. Sevilla is a city so amazing! The cathedral,the square and the architectural style….now I can’t wait my travel to Sevilla 🙂 Thanks for sharing it Leighton!